CENN has been implementing a regional project: Promoting Environmental and Social Accountability in the Mining Sector in the Caucasus, aiming to reduce poverty, enhance environmental education and awareness, enhance environmental and social security related to mining activities and foster sustainable rural development. 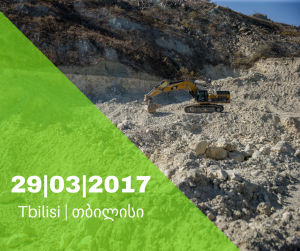 The conference — Environmental and Socio-economic Implications of the Mining Sector and Prospects of Responsible Mining in South Caucasus. The conference will be held in Courtyard Marriot hotel (4, Freedom Square, Tbilisi) on March 29, 2017, at 10:00. The purpose of the conference is to introduce stakeholders’ environmental, social and economic impact of mining in the South Caucasus and the prospects of its responsible operations. The conference will present the activities implemented within the 3-year regional project and their results in the South Caucasus. The meeting will be attended by our partners from Armenia and Azerbaijan.